← Have You Tried: Tomatillos? 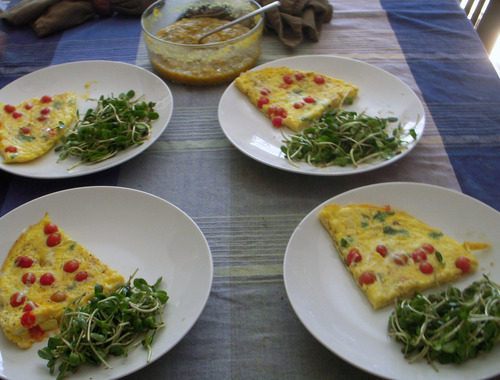 You already know that we’re frittata fans – they are so easily adaptable to whatever you have in your fridge that they make a tasty and fast meal at any time of the day. Look at this delicious lunch that Karl recently whipped up for the team! 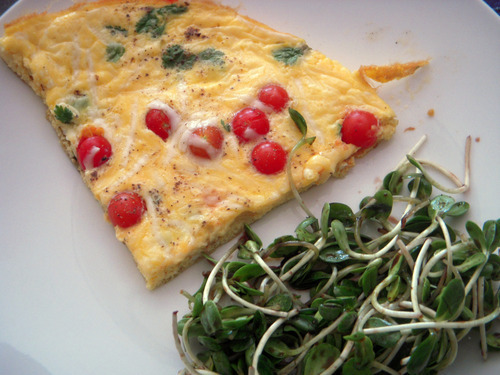 Packed with homegrown basil and tiny cherry tomatoes, and topped with a sprinkling a cheese, it was fantastic paired with a simple salad of sunflower shoots and a drizzle of Karl’s homemade super spicy tomato salsa. Stop by a farmers market near you this week, pick up some fresh eggs and veggies, and treat yourself to a simply satisfying meal! This entry was posted in In the Kitchen (recipes & more) and tagged farmers markets, fresh food, frittata, karl rosaen, lindsay jean hard, Real Time Farms, tomatoes. Bookmark the permalink. 1 Response to Lunch Break!